In the current corporate landscape, audio/video (AV) systems are in the critical path for conducting business. 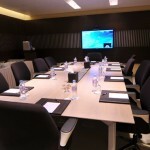 With the continued, regular use of teleconferencing, videoconferencing and web conferencing, the desire for ease of content sharing, and the proliferation of systems that support bring-your-own device (BYOD), large and small businesses alike need technology to operate efficiently in order to communicate effectively. As the reliance on AV systems grows, so do the resources needed to support them. Traditionally, a “break/fix” mentality was used for AV systems – wait until a critical component in the system fails, then rush to fix it. K2’s Managed Services enable you to be proactive, and focus on preventing failures before they can disrupt a meeting, a class, a performance, or a broadcast. A well-maintained, proactively-serviced system will always function better than the alternative. Offloading the day-to-day responsibility of AV systems maintenance to K2 frees up your staff’s valuable time to focus on the health and operation of your business, and not the technology it uses to conduct its business.